Captain Archibald Haddock is a fictional character in The Adventures of Tintin, the series of classic Belgian comic books written and illustrated by Hergé. He is Tintin's best friend, a multi-millionaire seafaring Merchant Marine Captain. Haddock is a deuteragonist of the series. He was initially depicted as a weak and alcoholic character, but in later albums he became a more respectable and genuinely heroic socialite, although he continues to drink rum, and whisky&mdash;his most noble act being in the pivotal Tintin in Tibet, in which he stoically volunteers to sacrifice his life to save Tintin. Although when introduced Haddock has command of a freighter, in later volumes he is clearly retired. The Captain's coarse humanity and sarcasm act as a counterpoint to Tintin's often implausible heroism; he is always quick with a dry comment whenever the boy reporter gets too idealistic. Captain Haddock was introduced in The Crab with the Golden Claws. Until Haddock's introduction, supporting characters would only recur irregularly, and mainly in the background, used more to build continuity than serve as protagonists. Hergé, however, realised Haddock's potential as a foil to Tintin, and established the character as a permanent addition to the cast. Haddock was first introduced as the rum-loving captain of the Karaboudjan, a merchant vessel used—without Haddock's knowledge—by his first mate Allan Thompson for smuggling drugs inside crab tins. Because of his alcoholism and temperamental nature, he is characterized as weak and unstable, at times posing as great a hazard to Tintin as the villains of the piece. He is also short-tempered, given to emotional and expletive-ridden outbursts, and capable of infuriating behaviour; at one point in the album he even attacks Tintin when, traversing the Moroccan desert, Haddock has the sun-induced delusion that Tintin is a bottle of champagne and tries desperately to pull his head off. However, Haddock is a sincere figure in need of reform, and by the end of the adventure Tintin has gained a loyal companion, albeit one still given to uttering the occasional 'expletive'. 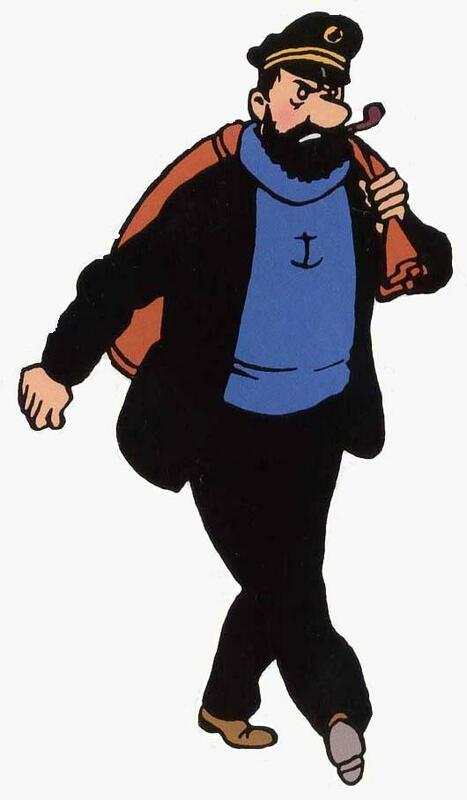 Hergé also allowed himself more artistic expression through Haddock's features than with Tintin's. Michael Farr, author of Tintin: The Complete Companion, notes: "Whereas Hergé kept Tintin's facial expressions to a bare minimum ... Haddock's could be contorted with emotion." Farr goes on to write that "In Haddock, Hergé had come up with his most inspired character since creating Tintin" and sales of the volume in which Haddock was introduced indicated the character was well received. After a fairly serious role in The Shooting Star, where he is shown to have become the President of the Society of Sober Sailors, replete with a cabin full of rum, Haddock takes a more central role in the next adventure, split over two books, The Secret of the Unicorn and Red Rackham's Treasure—indeed, his family history drives the plot. Upon locating the treasure, the newly wealthy Haddock retires. Hergé built the adventure around Haddock, furnishing the character with an ancestral home, Marlinspike Hall, or "Moulinsart" in the original French. Harry Thompson, author of Tintin: Hergé and his creation, writes that the introduction of this large and luxurious country house was "to provide a suitable ancestral home for Tintin and himself to move into." To achieve this in terms of the plot, Hergé also details Haddock's ancestry, something Thompson regards as distinctive: "Haddock is the only regular character whose relatives turn up in the Tintin stories at all ." By the time of their last completed and published adventure, Tintin and the Picaros, Haddock had become such an important figure that he dominates much of the first half of the story. He is especially notable in The Red Sea Sharks, where his skilful captaining of the ship he and Tintin seize from Rastapopoulos allows them to survive until they are rescued. In the 2011 film, The Adventures of Tintin: The Secret of the Unicorn Haddock is initially portrayed as a drunk, who is always in search of alcohol. Tintin endeavours to cure the captain of his alcoholism, but eventually discovers that it is an essential component of his character. Whole or part of the information contained in this card come from the Wikipedia article "Capitaine Haddock", licensed under CC-BY-SA full list of contributors here.